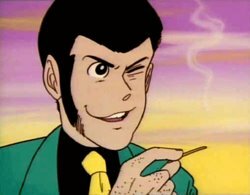 Put myself in a green jacket, black shirt and a yellow tie...and voila` - Watch out the treasures and diamonds because Lupin is here. So let me reveal you something. At work, I'm known as Lupin because they say I look like him - skinny, tall, a smirky grin on my face and cunning! That's what my work mates say at least. Do I really look like Lupin?! Ma che??? It's carnival, so it would be a good opportunity to try it out in the Republic Street...Well...no...I don't want to be arrested by Zenigata!